Temporary files are the primary reason for a sluggish system, there are free tools available which can be used to keep a system clean by running them at regular intervals like weekly, fortnightly based on the usage pattern.Some of the free tools like CCleaner are sufficient for most users but there are also some aspects which CCleaner also misses out on like removing leftover files from Windows Update Installation , Language Files, Windows OS Sample Data like ( Sample Audio, Picture, Help etc., ) which can be consuming a good size of the disk space. Another disk cleaner application is Wise Disk Cleaner which has a very intuitive interface with 3 tabs Common Cleaner, Advance Cleaner and Slimming System and can get rid of data which a few other disk cleaning applications miss out on. The Common Cleaner – This tab helps search and get rid of junk files and internet files.There are 2 sections which search for junk files on the system and traces left in your system by internet based applications.This process can also be scheduled using the scheduler from within the app. 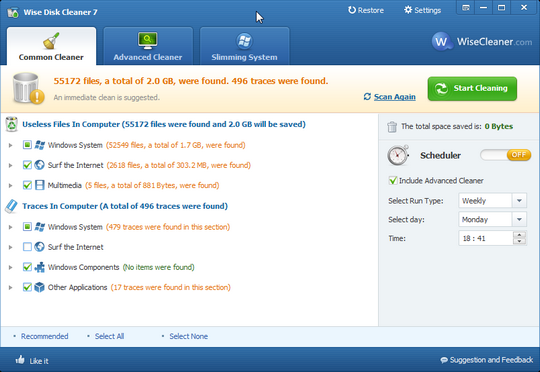 Advanced Cleaner – This helps scan for temporary files like ( .tmp,thumbs.db ) created by different applications which can be eating up valuable disk space.Users are well informed about the files which are listed in the search results, for ex. by selecting a file in the search results gives a brief description about the file. Slimming System : This tab is the most interesting feature of this application, which scans for Windows OS based files which won’t be required for most users like Windows Update Installation files, Windows Help Files, Sample Files ( Audio, Video, Pictures etc., ), Obsolete Windows Files etc.This really helped me get rid of 2.6GB from my system which was really nice. If you are concerned about anything going wrong on deleting these files, no worries Wise Disk Cleaner creates a “ Restore Point ” and if something does go wrong you can always restore it to the previous state using the “ System Restore”. If you fear recovery of delete data, then there’s also secure deletion which can be enabled from the Settings > General Tab. To make things even more easier, there is a way to create a simple 1-click desktop shortcut which can run the cleaner automatically running all the cleaners at once without the need to individually run the cleaners. 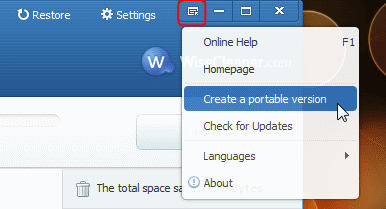 Wise Disk Cleaner can also be converted into a portable app once installed to be used on other machines, without the need of installing it again.To create the portable version of Wise Disk Cleaner, click on the icon beside the Minimize Button, and from the drop down select “ Create Portable Version ” which creates a zip file.Extract it and run the “ WiseDiskCleaner.exe ” from folder, USB Drive. If a portable version is available directly from the developer, it would be more easier for users instead of having to install and create portable version for themselves.Program Uninstaller is missing from this application, which can be very useful.Until this is part of the program you can use few other 3rd party softwares like CCleaner along with Disk Wise Cleaner which is compatible with all Windows OS versions.